I am currently 18 and I think this article is brilliant. It made me think. I’m going to transform this year into the best year of my life. I’m 18 , and I have had the same questions since I graduated. Great post. There is one i would add to this list — keep a journal. As a kid, i was inspired by the old series ‘The Waltons’ and began keeping a personal daily journal – similar to what ‘John Boy’ did – summarizing my day just before calling it a night. On many an occasion, it’s served as a catharsis – a great way to safely empty out whatever was boiling up in me at the time. Over the years, I’ve been amazed at the many twists and turns that life has taken – the ups, the downs and the in-betweens, and were it not for that journal, i would have forgotten many of the lessons that life had a way of subtly teaching me when I never saw it coming. I’m 18 and this actually made me realize a lot of changes in need to work on!!! Thank you! It is really very inspiring. Great read! Also, in my opinion number 9 should be number 1 and the words “too much” should be removed. From a 48-year old. Great read! I am 18 now and I am sure that after 10 years I won’t have to say “I Wish Someone Told Me When I Was 18.” Thanks. This article helped me. I concur! If I may be bold enough to add one: Always take your dreams for the future seriously. And, by the way, I love your posts. Just discovered this site today. Very valuable to all those who want to achieve more in life. Thank you. I just read this article… I too wish someone told me these things nearly 30 years ago! I did go directly to my favorite audio book site and purchase ‘The Road Less Traveled” before I posted this comment, thank you! After the years which i have lived and after my experiences , i think i still need to re-read these words from time to time. Thank you for this advice and this wonderful article. This article is superb! Great advice! This advice could be applied to everyone’s life. Wonderful. Some smart thinking here, kids. Chipping in with my own two penneth: Advice I wish someone had sat me down and slapped into me as a teenager: If you think you’ve fallen in love with someone but are terrified of telling them because it’ll “ruin the friendship,”…tell them anyway. What you have isn’t friendship if you’re busting to grab them and kiss them 24hrs a day. It’s something else. And something worth going for at any cost. Again great article! Expecting more beautiful ones like this one! Fantastic advice. I would also include save early, save consistently and save enough! Awesome Article brother.. Keep it up… nice blog. The best present for me this year is to have found this blog. I enjoy reading every article, especially this one! Thanks. I would add #19 Find an older mentor in the career field that you plan to study. Often times what you “envision” a job to be is quite different than reality. Mentors can be friends of your parents; neighbors; people you attend church with; or someone that is already in the career field that you want to be in. Most older people will feel flattered when asked if you can shadow them on their job or schedule a coffee date (please pick up the tab, since you are the one benefiting) to get a true perspective on what their career entails. Who knows, they may become a life-long mentor. Good luck! I am currently 24 years old and I definitely agree with all that you have said above. Honestly I wish I had known half of the list above when I was 18. I am so thankful I read this list today, while I am still 18. Will definitely put all of this to good use. JazakAllah (thank you) for all the awesome stuff you post! Excellent Blog and a definite good read. Everyone should have a list like that. Find your own voice to tell your 18 year old self. Reading the comments here, there is alot of 18 year old that are very greatful for your post but they are forgetting one thing… Don’t listen to what other say you should do… Don’t take his list here and make it your life mission… read it, digest it and move on guys… Life is waiting for you to experience it! Thank you Marc for this wonderful post. I would like to use these tips in my life ahead, they very authentic and useful. This helps motivate as I change jobs and find my way. Though I’m not 18 years old anymore. LOL. I am eighteen and completing my final exams before I go to university. This has made me realise that I’m not living my life how I want to be. I’ve applied for the wrong degree and I need to fix that so that the rest of my life is easier to enjoy. Thank you. This is just fascinating. Thank you very much. I think number 1 is so important. It is only by making mistakes that you can learn. Not being afraid to make mistakes is so important. We all make mistakes, learn, move on, make more mistakes. Eventually you will be successful. I am also 19 years old and just finished a rocky first year of college! Thank you so much for your advice, I can really relate to them and I believe that this coming year I will work to enjoy and work harder for my life and happiness. These days I feel like I am constantly worried about tomorrow and never appreciating today. Worried about everything so much that I am afraid go live my life to the fullest. This year has definitely been scary but now I am confidence to live my life with more hope and joy 🙂 Now I do want to talk to more new people, stop judging myself to be a failure and try to experience new adventures. Life is surely a roller coaster but I think sometimes I forget to enjoy the ride. Thank you again! Thank you, I feel as if this was a wake up call. I needed to hear something like this from an experienced adult. I turned 18 about 43 minutes ago and I googled, ” I turned 18 and I don’t know what to do with my life.” I honestly didn’t know what was going to pop up in the search field, but i’m glad to of come across this. Recently, I’ve been realizing that this upcoming fall means new beginnings/experiences and transitioning to the “adult” world. All this makes me extremely overwhelmed. It’s reached the point to where I didn’t feel like taking initiative with my life for fear of not liking what’s to come. I’ve spent my summer slacking and sleeping, even missing important deadlines for school because I wasn’t excited about this brand new start. I should’ve looked forward to it all this time. I never step out of the box, but your right in order to get places and learn from your mistakes you must. No one will hold your hand and help you out, as good as that sounds at times. You need to steer your life in the direction you want to go because time passes extremely fast. Everyone will leave you behind because they’re doing what’s best for themselves. Much Respect. Reading this puts a burning in my stomach as I turned 40 this summer. I look back with a lot of bitterness about my youth, but that’s not propelling me forward in the least bit. I feel in a way I’ve missed out on so much that it’s too late for so many things. Then I feel guilty for not being thankful for all of the great things that I’ve some how seemed to accumulate in my life thus far. I agree Marc, these are definitely things I wish someone would’ve told me when I was 18yrs old. I love point 12. Sitting in silence and reflecting is a great way of remembering your day. In the evening I like to look back through my day in my mind. Focusing on the good stuff and thinking how I would do the bad stuff differently. This is fabulous. I am forwarding this to my two sons. Shay (who will be 16 on Jan 4th) and Sam (who will be 14 on Feb 14th). As a single mom, and with an absent father this blog would be priceless and will add (and summarize) to the things I wanted I want them to so badly remember. I also hope that these two impressionable young ambitious teenagers will read your other amazing blogs. 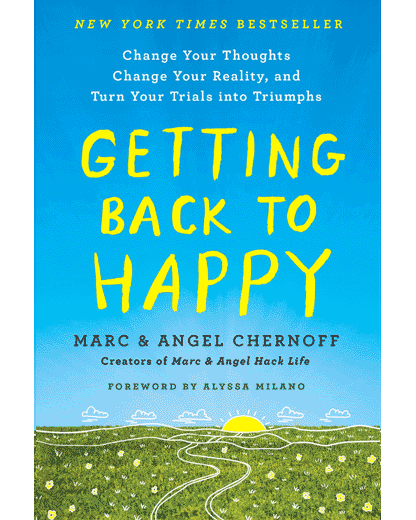 Marc and Angel you are simply the best… you change million of lives with your blog posts and book. Wow! I’d say pick two that really jump out at you and of those two, take one and work on it really strongly for the next year! Then next year, do the other one! This is the perfect post to come upon right now in my life. My daughter well one of 5, turns 18 on the 16th of July. I tagged her in a post on fb, because I want her to read it. I wish I had when I turned 18. But I do believe, ALWAYS do what you LOVE and you’ll never work a day in your life. I don’t. I love being a massage therapist. Really needed to read this today. Beautifully put. Thank You. Today is my sons 18th birthday, I sent him the link to your article. It’s perfect advice and puts all the important things into perspective. Thanks so much! All really good points. However crucially important to accomplishing any dreams, goals, or quality relationships is to take care of your health: body, mind and spiritual soul. Around 16-18 and into your 20’s our culture markets the insidious use of booze , drugs, and other mind altering avenues to have fun. right when our brains are at the peak of development and the potential to do pathological damage. use stunts true emotional maturity, skills in expressing our authentic self, and learning to cope with life’s challenges with positive emotional growth, integrity and honesty. If I could change one thing about my 18-29 year old self…it would be to steer clear of the crowd who thinks every occasion, weekend or relationship should involve alcohol, or pot consuming times for fun. what a waste…of valuable time, brain cells , and loss of authentic relationships. Great advice for any age, from my own experience the two most important things is to be healthy and happy. There are many things which lead to these things, you must be constant with your efforts to achieve both not only in yourself but those around you. If those around you are also healthy and happy then this will pass back to you, ‘you are the average of the five people you are with’ being healthy and happy is a great average. I am going to be 18 next month. I just accidentally found your blog. This article will surely change my life. Thanks for the golden piece. I love u guys. This was helpful. This is such a great article, it gives you great insight and helps you tackle “difficult” situations with much more ease. Thank you. Thanks for this article. I’m going through a difficult phase right now. I’ve just dropped out of college and I’m planning on doing law but I’m not really working towards that goal. I really don’t know if that’s what I was meant to do and if dropping out was the right decision but I hope it all works out. I’m going to try to utilize this spare year to the best of my ability unlike what I’ve been doing now. This was just the push I needed. The mistakes she is likely to make — pregnancy, drugs, abandoning her education — are so life-altering she might not recover. She’s already much too impulsive. This would not be good advice for her. “Hard work isn’t hard when you concentrate on your passion.” That hit me hard. My DREAM is to become a physicians assistant, and I’ve done good in high school with grades, but I’ve been scared of college because I know it’s a whole different ballgame. This gave me an entire new perspective. Thank you so much.